Nail any tone you want and amplify it with classic Celestion sound. The B-52 ST-6012 60W Tube 2x12 Guitar Combo Amp with Celestion Vintage 30's has a 100% all-tube signal path that combines Sovtek 6L6 power tubes with 12AX7 preamp tubes for solid tube tone and classic breakup. 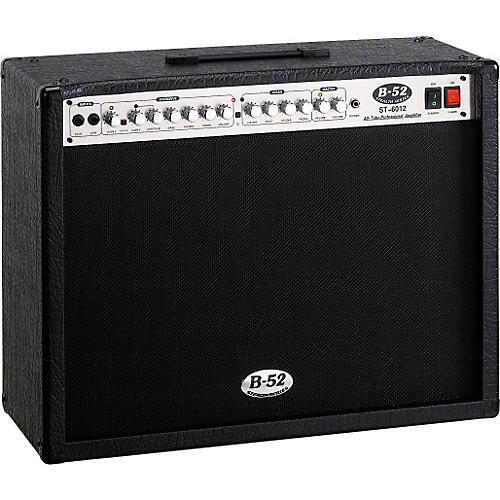 This B-52 combo amp is capable of monstrous gain, extreme distortion, and sparkling clean tones through 2 channels. All those tones are accurately reproduced by a pair of 12" Celestion Vintage 30s with 70W handling. The Clean and Overdrive channels have their own sets of volume and EQ controls (3-band bass, mid, and treble), with 2 gain knobs and an interactive Contour control (Gain 2) on the Overdrive channel. You can further shape your tone by selecting 3 rectifier settings. The solid-state setting delivers the tightest low-end definition and fastest attack. Tube A gives you a vintage attack and feel with the warmest sound. Tube AB1 is in between the first two: punchy, warm, sound with more definition than Tube A. B-52 made the ST-6012 combo amp roadworthy with 13-ply Baltic birch construction. A combo you can play anywhere and can easily craft any tone you want. Order now.